If you're traveling in the popular Cades Cove area of Great Smoky Mountains National Park later this week, you might see smoke, fire trucks and firefighters. But it's all under control. 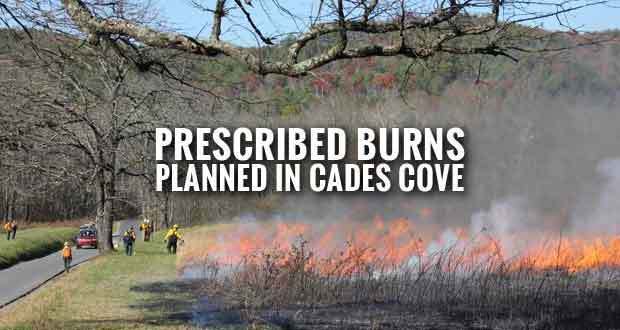 The Smokies and the Appalachian Piedmont Zone fire management staff plan to conduct prescribed burns on about 500 acres of fields within Cades Cove, weather permitting, on Thursday and Friday, Nov. 29 and 30. Last week, managers completed prescribed burns across 88 acres of fields near Sparks Lane. Over the last 20 years, park managers have conducted these burns during the spring and fall under specific conditions to safely reduce fuels, restore meadow habitats and maintain the historic landscape of Cades Cove, which lies on the Tennessee side of the park and is one of the most popular areas due to the Loop Road of historic homes, barns and other structures. These seasonal controlled burns help perpetuate native herbaceous species that provide high quality cover and foraging opportunities for a diversity of wildlife including deer, turkeys, and ground nesting birds. Visitors should expect to see firefighters and equipment along Sparks Lane and the western end of the Cades Cove Loop Road. The loop road and historic structures will remain open to visitors, but there might be brief delays and temporary closures to ensure public safety during burn operations.